I love when babies start to move! It is so exciting to watch them realize that there is a whole lot more to life than the small area where they've been hanging out. It is so exciting when my kiddos start crawling and walking and figure out that our house has so many fun places to explore! Several of our favorite playtime activities for 9-18 month olds become a whole lot more fun too! During the stage when my toddlers start walking, I spend a lot of my free time trying to figure out how to minimize injuries. Padding corners on tables, pushing in chairs so that hopefully they won't climb up on them, and begging my big kids to not show their sister how to climb up onto the bed or couch! I am always excited when babies are mobile but hate when they get hurt! You'd think I'd be better at this by now, since we're on baby #4, but no luck! Falling down is inevitable and is actually an important skill and part of the learning process. You can fortunately reduce injuries by keeping kids on carpet and away from sharp corners and surfaces. 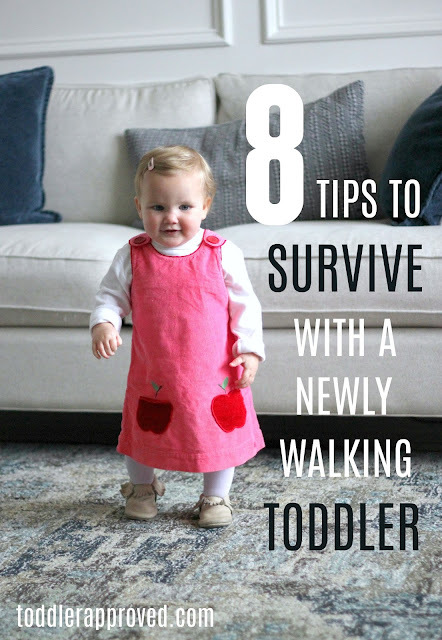 During this time period as little toddlers are learning to become better walkers, here are some ways that I survive and avoid being completely stressed out! 1. Practice staying silent and just observing as your child walks and falls. Stay close by to help if needed, but try and let your child be as independent as possible. If your child does fall and is sad, comfort her. I always wait a few seconds to see if my daughter is actually hurt before jumping in to comfort her. Sometimes she is off and moving immediately and rushing in to comfort her would've interrupt her learning experience. 2. Wear shoes and clothes you can move in as you roam around after your little one. I hate it when I am in heels on Sundays and my toddler makes a break for the parking lot. Flats are so much easier to run in! 3. Build exploring time into your daily schedule before you need to run errands or do something where you need your walker to walk less. For example, take your toddler for a short trip to the park BEFORE you head to the grocery store where they need to be strapped in. Or park a block or two away from the store and let your toddler walk on the sidewalk for a bit before you go inside. 4. Get some comfy, supportive shoes for your little one while they are learning to walk. We usually use moccasins (Freshly Picked moccs are our favorite) out and about and go barefoot at home. We also love Keens for outdoor playtime! 5. Put your little one in pants and long sleeves (when possible). Knees and elbows hurt a bit less when they are covered when kiddos fall, especially outside at playgrounds and on concrete or when they learning to run (especially down ramps!)!! 6. Create a safe cozy stress-free space in your home where you can let down your guard a little bit while your little one explores. We try and keep this safe area free from furniture kids can climb and fall off of. We have our stairs gated off and a few play areas in different rooms that are perfect for toddlers. When we have multiple falls over the course of the day, it makes me so sad and anxious! I just try and remind myself that she is learning and it will get better! 8. Avoid your temptation to put them constantly in a bike helmet. I often wish for a completely padded room for my toddlers. Our house has a lot of wood floors which is terrible for falling, but easy for walking! Once they start carrying things around WHILE they walk, it gets even crazier! Do you have any other tips that help you stay sane during this stage with newly walking toddlers? I am always a wreck!